The scariest thing about the DVD release of The Buried Secret of M. Night Shyamalan is that Buena Vista placed a list price of $29.99 on the title. This is the same shameless piece of hype that originally aired on the Sci Fi Channel prior to the theatrical release of Shyamalan’s The Village. The Buried Secret of M. Night Shyamalan is billed as “an in-depth look at the director,” a man we learn early on is notoriously secretive. On the Friday prior to the airing of this preposterous “crocumentary,” the Sci Fi Channel admitted it was a work of fiction, a part of a “guerilla marketing” campaign for The Village that was intended to blur the lines between reality and fiction. They even reported that Shyamalan attempted to shut down the project as the film crew got too close to his secrets, including a drowning incident that served as a catalyst for Shyamalan’s interest in the spooky. Both Shyamalan’s antagonistic stance and the drowning turned out to be works of fiction. The film’s blurring would go so far as to feature a pizza delivery boy who becomes a regular visitor, getting enough screen time to make Bill and Ted envious. But then again, this isn’t your typical pizza boy. He also happens to be this schlockfest’s equivalent of a supernatural guru. Nathaniel Kahn, the Academy Award-nominated director of the documentary My Architect: A Son’s Journey, sheds all credibility as a documentarian and a filmmaker as he hangs out with teenage fans who clearly know more than he does; he’s a filmmaker who acts like he was totally oblivious to Shyamalan’s existence before being put on this project. One of the kids logs him on to a “secret” Web site (the URL is perpetually out of view) where fans chat and are ranked based on their knowledge of Shyamalan trivia. Of course, some of those unseen, online fans are downright psychic. Among the “in-depth research” conducted by Kahn are “unapproved interviews” with Deepak Chopra and neighbors of Shyamalan who somehow scored videotapes of the films Shyamalan made as a teenager and which, as part of his shtick, he has conspicuously trumpeted on the DVD releases of The Sixth Sense, Unbreakable, Signs, and The Village. Most people keep their Super 8’s boxed up for a reason; Shyamalan should do the same. His apparent self-infatuation is not universally appreciated. Following up on the Depp interview, Adrien Brody, who co-stars in The Village, fights back the smiles as he coyly sidesteps discussing the film and Shyamalan. It’s an outrageous bit of contrived “coincidence” linking the Depp and Brody interviews together, one that cries out “fake” with all the subtlety of Bill Murray getting slimed in Ghostbusters. The two hours are filled out with other ridiculous incidents and horribly staged “heated discussions” between the documentary’s editor, Kahn, and Shyamalan. Talented director though he may be, Shyamalan can’t act. Neither can Kahn. Putting them on screen together, feigning edginess, creepiness, and drama, is a painful thing to watch. As a hoax and as a piece of film marketing, this crocumentary is a dismal failure; it simply plays too stupid, nothing is presented credibly and nobody acts realistically. The end result is a misfire that reduces Shyamalan’s stature; he comes across, inadvertently, as a man who has read too much of his own good press. 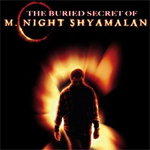 The Buried Secret of M. Night Shyamalan should have been relegated as a supplemental feature on The Village DVD, rather than served up as a stand-alone feature. Even better: this ludicrous piece of junk would itself be best left buried. The Dolby Digital 5.1 Surround and picture (widescreen 1.78:1 enhanced for 16x9 TVs) are neither spectacular nor remarkably flawed. Also available are English captions and French and Spanish subtitles.